Ogden Regional Medical Center (ORMC)has been serving Weber County (pop. 185,000) and the city of Ogden (pop. 70,000)for more than 50 years. Their current facility was built in 1985 and has 239 licensed beds with over 300 physicians and over 1000 combined employees and volunteers. 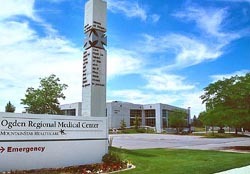 Ogden Regional has received 9 Five-Star ratings from Healthgrades.com in obstetrics, cardiology and pulmonary/respiratory services, ranking them in the top 15 percent of hospitals nationwide in those areas. The specific services in which they received this honor include: obstetrics, coronary bypass surgery, treatment of heart attacks & treatment of respiratory diseases. The ED supports up to 11 bed that includes one trauma, one GYN, one pediatrics, one ENT, two orthopedics bed, and 4 general exam sees 21,000 ER visists per year.. EPIC board member, Dr. D. Joan Balcombe, received ED Physcian of the Year by the State of Utah for her work at ORMC in 1996..
Ogden Regional Medical Center 5475 S. 500 E. Ogden , UT 84405. To view their website click here.